Britain's Human Rights Act 1998 is the latest in a wave of legislative and constitutional instruments that have been passed in a number of countries (including Canada, New Zealand and South Africa) and which put human rights at the top of the public law agenda. For the most part these instruments are widely welcomed by senior judges and by academic and practising lawyers, many of whom will have campaigned for their introduction. There are, however, very considerable doubts about the wisdom of these developments within the democratic tradition of government which remain unanswered. This collection of 20 essays written by an array of internationally prestigious scholars explores these reservations. All the contributors endorse the importance of human rights within any democratic system of government, but question whether the primary responsibility for the articulation of these rights ought to be taken away from the normal political processes of representative government; they also consider the constitutional implications of doing so. Specifically, the extensive shift of political authority to the judiciary which is involved in Britain's Human Rights Act is critically examined and other ways of specifying and promoting human rights in more democratic forums are considered. Particular attention is paid to the priority which should be given to economic and social rights within the new constitutional settlement. Overseas contributions, ranging from Eastern Europe to South Africa, via North America and Australasia, illustrate the pitfalls of importing other constitutional models. Written throughout in an engaging and accessible style, this book is essential reading for all those with an interest in law or politics. 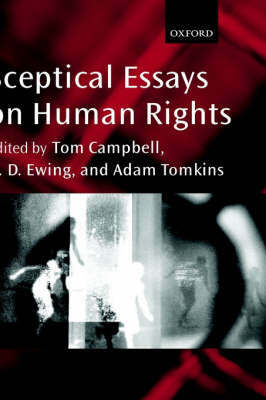 "21 essays written by an array of prestigious scholars with expertise in domestic and international law."